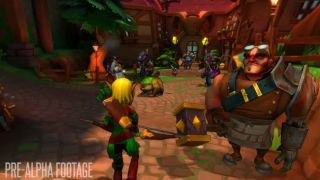 Earlier this week, Trendy Entertainment announced that Dungeon Defenders 2—a follow-up to the co-op action tower defense original—will be free-to-play and feature a competitive MOBA mode. The new mode is already in closed beta, but the continuation of DunDef's co-op won't be playable until later this year. Even so, Trendy has released a pre-alpha co-op gameplay trailer—it's bigger and prettier, but doesn't look to stray from the original in any fundamental way. That's what I want: more super-saturated tower defense. We've got a while to wait, though, so in the meantime we hope to test out the new competitive mode soon.